A couple of days ago we had Jennifer Pahlka Founder of Code for America and Tim O’Reilly from O’Reilly Media visiting Hi-Capacity for a talk. They were both very different people but cool in there own way. O’Reilly reminded me a little of Doc from back to the future but a little more centered. Jennifer a true visionary. Both speakers were on top of their game regardless of a lack of sleep due to traveling, much respect. Recently we had a team from Mozilla come to The Box Jelly for the week to build and release Firefox 10.0.1 (amongst a few other things). It was a really exciting experience for our team and a chance to step our game up. I have a lot of people ask me (borderline scolding me) why didn’t you tweet the sh*t out of them being there. Well I’ll tell you. Respect and the Hawaii Advantage. 1. I have a lot of Respect for their G.S.D. (get sh.. done) The purpose of their trip here was to deliver. In our position (as the box jelly) we have to think about what is best for our community and guests. I made a conscious choice not to heavily publicize their presence till after they left so they could work without distractions. If you’ve updated your Firefox browser you know that the mission was accomplished. Yes we plan on working with them to share the Mozilla movement with the island community in the future. 2. The “Hawaii Advantage” is something I’ve been striving to understand since we embraced the journey of creating Hawaii’s 1st cowork space. The Mozilla team choose Hawaii for two reasons, location and price. Hawaii made logistical and financial sense plain and simple. Yes I too was surprised to hear that in a hyper connected world, global teams need to meet face to face from time to time. After the initial shock it made complete sense. Their visit here was inspiring and renewed my resolve to keep pushing coworking in Hawaii. Mahalo Mozillans for sharing your time here with us. It was fun. Let’s talk branding w/ Eneri Abillar of Vapor Studio. This Thursday at 7pm we will have a guest and fellow coworker Eneri Abillar Creative Principle and Industrial Designer at Vapor Studio share his experiences in branding. I was at the Apple store this past weekend browsing and saw one of Eneri’s products on the shelf. Very cool. I hope you can make it out. Worldwide #Jellyweek is coming to The Box Jelly. If you’ve never experienced a Jelly (Coworking) here is your chance. We will be letting people tryout coworking for free Monday through Friday from 10am to 6pm. Every evening we will be having an different event in partnership with members of our community. Thursday 7pm Hi-Capacity Open House. Check out what all the hype is about with Hawaii’s maker community. We will be headed to the IDGA mixer down the road after. Friday 7pm Sirens + Sailors mini-concert series. Organik Clothing will be hosting a series of mini concerts kicking off on Friday. Here’s an upcoming Hi-Capacity event just in time for Christmas. Blinky lights!!! We’ll be doing an incredibly fun beginner’s soldering workshop led by Jeremy Chan. Jeremy Chan is an experienced electrical engineer working at the Hawaii Space Flight Laboratory. No tools or experience is necessary, but feel free to bring your own. After this lesson, you’ll be ready to solder on your own. Basic soldering concepts and how-tos. We will be practicing on PCBs. 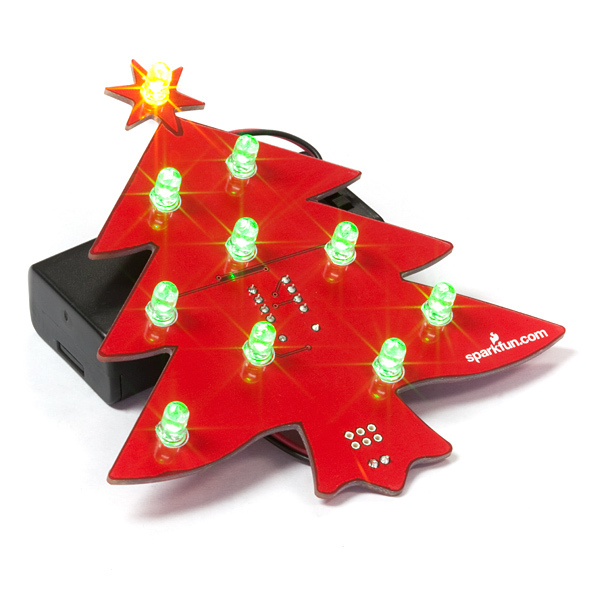 Then we will be building an LED Christmas tree! It’ll have blinky lights and will be a gift for you to take home! It’s an ornament you can show off your DIY skills with your family, friends and coworkers. “That looks really cool, where did you buy it?”, they’ll say. “I made it myself” responding with a grin. Using the The Box Jelly space. Because we are having a paid event, we will be renting the space. The rate is $280 for 3 hours or 1/3 of our profits, which ever amount is less. Any remaining profit will directly towards improving our current and future Makerspace. At The Box Jelly, there will be street parking available, although it is limited. You can park at the Sports Authority across the street. Questions can be directed to maker@hicapacity.org. What would you like in your Cowork Space? We just opened The Box Jelly this past summer and before then we were poling friends, family, and many of our entrepreneurial colleagues about what they would want in a new space. We have been “popped up” for five months now and we want to hear from our community again about what they want in their workspace. We are a coworking environment which means we offer collaborative workspace for the aspiring entrepreneur, independent freelancer, or that individual looking for a change in their work-life. That said, holler at us now and tell us all about what you want! Is it peace and quiet, cool background music, gourmet coffee, great people to work around? Speaking for myself when we flew across country doing research about coworking it was a cool looking work environment that drew me. I wanted a space that offered a modern feel, some artwork, comfortable furniture, a few good books (I’m a lit nerd) and great lighting. Just to get the juices flowing let’s throw out a few ideas!!! The conference is Saturday, December 10th at UH Manoa, with the goal to highlight interesting Hawai’i-based people, projects and organizations working in science, technology and interactive design. The day long event seeks to facilitate education and networking within the Hawai’i technology community as well as helping Hawaii technologists connect with global technology leaders. Along with Ignite Honolulu 2, you will be exposed to Mobile Development, Web Apps for the People & Hawaii’s New Broadband Initiative, Kukui Cup: Gamification of Energy Efficiency, Social Media, and 3D CG & Animation. To attend the 2011 TechHui Conference, click here. General admission to the 2011 TechHui Conference is $35, and $25 for TechHui members. If you are unfamiliar with TechHui, it is Hawaiʻi’s science, technology and new media community. Sign up to connect with a network of over 2,500 members in Hawai‘i. Visit the TechHui website, here.